Yes "CWF - Cooking with Whole Foods" which is the brain child of Kiran of Sumadhura is here in my blog for the next two months. By the name you can understand the purpose and essence of the event. Coming to think of it, not a day goes by without any of the whole foods being used in our cooking. The theme for the next two months is "Sesame Seeds". There is no need to introduce these lovely seeds to anyone who does any sort of cooking... be it pure Indian, Middle Eastern Cuisine, Savoury cookies, breads, rolls and bakes etc. Some information about the origins of this seed: The word sesame means "plant oil"... it is evident when from the oily nature of the seed. From this oil "Gingelly oil / Nallennai " is extracted. In hindu religion, sesame seeds represents immortality. That is the reason why sweets made out of sesame seeds is used as offerings to God and the oil is used to light divas next to ghee. It is one of the oldest condiment known to man and is abundant is good oils, vitamins and minerals. For more info about this seeds , please visit the following link - Health Benefits of Sesame Seeds . 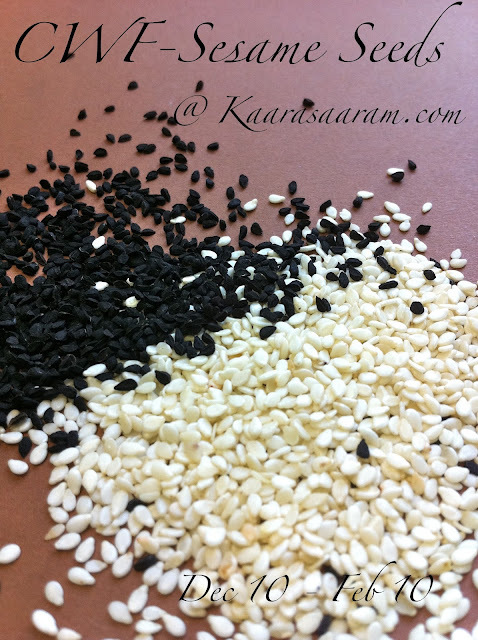 1.Create a new recipe or cook any recipe using sesame seeds [white or black] and post it in your blog from Dec 10' 2011 to Feb 10 - 2012. It can be anything from a chutney to a spicy powder podi to a dip to a savoury tray bake to a warming bread loaf. 2.Link the recipe to this announcement page and Kiran's announcement page. 3.Please include the logo as it helps spread the word. Multiple entries are welcomed. 4.Archived posts are welcomed only if reposted and linked to both announcement pages. 5. Both vegetarian and non vegetarian recipes are accepted. f.Pic of the recipe around 300 by 300 pixels. 7.Non bloggers , do send in your entries to the above email id and I willpost the recipe in my blog. Nice event! I love the flavor or sesame in chinese dishes and even in bakes. Will see if I can submit something. Happy Hosting! Thank you for hosting CWF.Will send in my entries.Happy hosting. Nice Event Reva.Will soon post and send U my entry.Happy hosting Dear!. Nice event dear..will try to send my entry soon. Happy hosting Reva,will send my entries soon. Lovely event n happy hosting!! Reva, the fudge looks absolutely delicious. Anzzcafe has completed 1 year of blogging. You were amongst the first readers of my blog and your words were a great source of encouragement. Thank you for being a part of my small world. Great event. Count me in. Happy Hosting dear. Will Send my enries..
Nice event :) Have sent you my recipe using sesame seeds.